I will appreciate guidance. Please check the photos as I am assuming I first have Rocky Mountain Brakes. Reading the forums and Google search i have seen mention of installation instructions, but no adjustment procedures. I did read that you want to adjust (the metal rods?) to the (Parking Brake?) and (Brake pedal) so the rear brakes work BEFORE the transmission brake. I am assuming it is a simple procedure similar to Model A brakes. 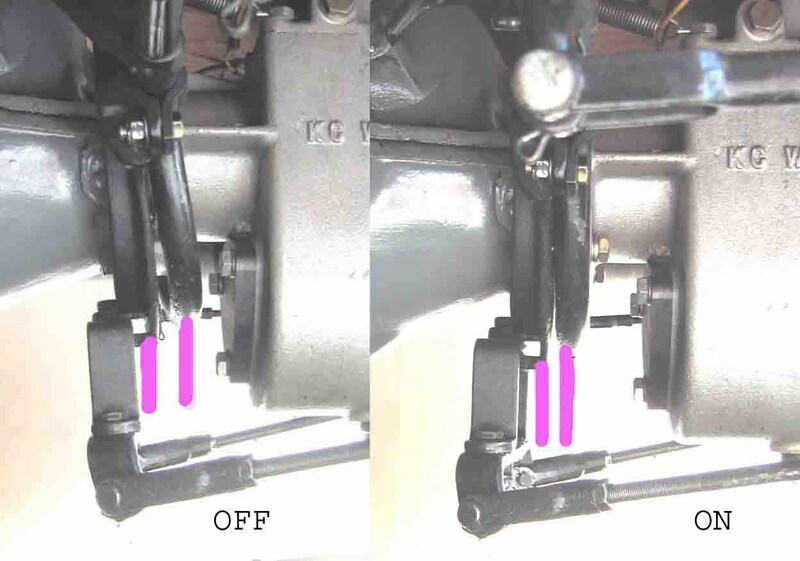 then adjust rod length using the brake pedal so rocky's work before the transmission brake. i assume you loosen the transmission brake before doing this, then adjust the transmission band so it works one inch from the floor board. No No No do not rotate as you adjust. It involves no turning of the wheels. 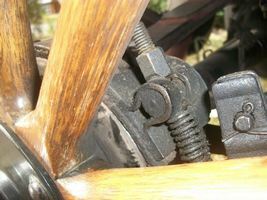 Disconnect the adjustable ends of all brake rods. Move hand brake lever to 12 o'clock. Adjust pedal links so you have neutral with the lever in that position. Now adjust R M brake nuts for clearance of about .020" or more but not less all the way around with a feeler gauge. You may have to re-position the two flat straps that guide the bands. Now reconnect the R M rods and check for lock-up. Now reconnect the emergency rods for no contact. Now drive the car for 500 feet and coast to a stop - no brakes. feel for heat if some, unscrew the hot side a half turn. Re-test and copy until you can drive with not friction. Now drive and apply brakes, they should work correctly. 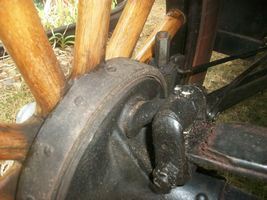 Now adjust parking brake so that they come on after the R M's do. If necessary, adjust trans brake for proper use in reverse. 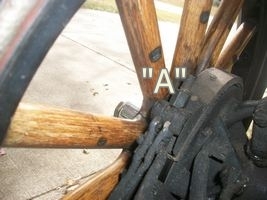 The Rocky Mountain brakes are self actuating so they grab once they engage. That is what is good about them as they do not require a tremendous amount of pressure on the pedal to work. Consequently, set the brake on the transmission so it requires more pressure to engage. That way it will help if needed in a panic stop going forward and will work in reverse because the auxiliary brakes are not self actuating when backing up. VAL, you are correct. Modern R M's do not work backward but they are twice a good as the old ones going forward because of the linkage. A good friend of mine has four wheel hydraulic brakes from a Nash Metropolitan and my Modern R M's from Bud Williams stop me faster than him. So keep your trans brake connected so you can back off of your trailer and drive as you should. Thanks all. I will jack it up tomorrow. Just a question. On the rocky mountain brake assembly each, at the top, has an adjustment screw-clamp assembly. 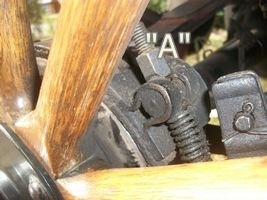 It appears this is used to adjust the distance between the brake shoe and the drum? Are these ever adjusted? That nut is only adjusted to get 20 thousandths around the drum. As the lining wears you might need to adjust infrequently. Well the good news, after "adjusting" the rocky mountain brakes took a short drive. Boy did the brakes stop quick! Great ! Trouble was stated to smell smoke - burning. Yup the rear brakes got so hot they burned and bubbled the paint off! Let them cool and come home. Start again tomorrow, Question. Look at the picture. To LOOSEN the brake do I turn the bolt counter clock wise?? then put a feeler gauge between the pads and the drum? You did not drive 500 feet and coast to a stop. Then feel for heat and tighten one half turn did you ! No I was bad. Took my 93 year old friend out for about a 20 minute drive for lunch. If you did not take the paint off the drum before installing the brakes they will burn off the paint. The problem is that the paint has now contaminated the brake lining and may take time to burn off. As long as they are not dragging when you are driving they should be OK but if they grab too much you might want to back them off a bit. 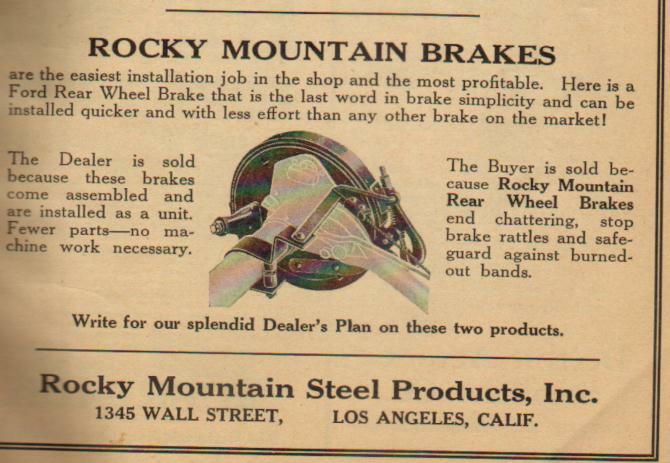 You should not need a lot of pressure on the pedal with Rocky Mtn. Brakes.